Panoramic Water View Aerial view of home Aerial view of home View to the right from yard. View to the left from yard. Looking back at house from yard by water. Panoramic View from Back yard King Bedroom with Flat screen TV King Bedroom with AC Room with 2 Twins in a bunk room AC Room with 2 twins Full bath with tub/ shower combo W/D in bathroom Bedroom with full bed and AC Full kitchen with gas stove Full kitchen and access to side yard with gas grill Open living room and dining room Open living room with working fireplace and flat screen TV Dining area Back deck / porch with outdoor dining and seating Outdoor dining Back deck View of the house from the water. New outdoor rain shower Hot water. 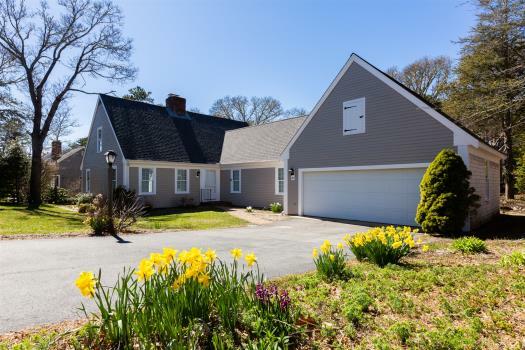 Classic Nauset Heights home sitting directly on the bluff with magnificent views of Nauset Beach, the Atlantic Ocean and Nauset Marsh. Short walk to inlet and ocean beaches. Vintage, rustic cottage character in unbelievable location. Great value for view. 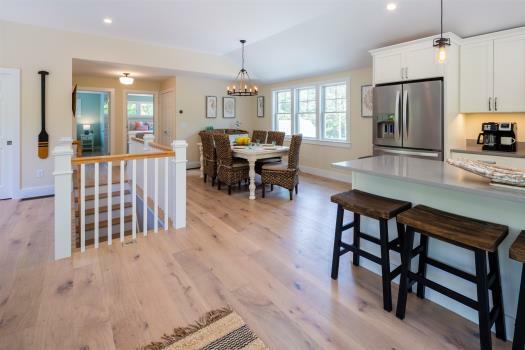 Wooden farmhouse style floors throughout except for Kitchen and Bath. Rustic cottage kitchen has updated appliances. Outdoor shower to rinse the salt and sand off after a day at the beach. Great front porch with dining seating for 8. A great place to enjoy morning coffee/ breakfast, an afternoon read or cocktails on the deck. The location and views are simply one of a kind. 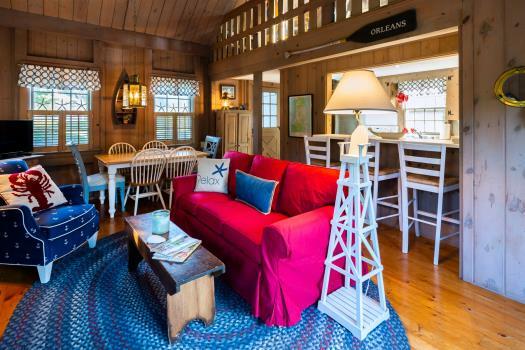 Spellbinding water views-nearly 180 degrees- from Nauset Harbor and the channel all the way to Coast Guard Beach in Eastham, over The Inlet to Nauset Beach and the Atlantic. 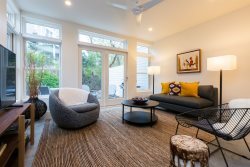 One of the first dwellings on The Heights, this charming vintage bungalow on the bluff represents all that was ideal in summer living since 1900. For many, it is still so today. Trailer a boat around to Priscilla Landing on Roberts Cove for deep-water access. On the ocean-side use the Association stairway down to meandering sandy pathways through the beach grass for access to both sides of the spit. Some may cherish this antique cottage just as it is, with its enormous great room, vaulted ceilings and original wavy-glass windows. Others may enjoy the spectacular lawn and views, either way it's a magical place to be. “We love this house and had a wonderful time. I love the whitewashed walls and the old cape charm of the place. We would love to return next summer. Thank you for sharing your treasure!!!" “The outdoor seating was great - sturdy, comfortable, good cushions much appreciated. Lots of sitting time on the porch!" “This cottage is in a spectacular location. The locale trumps everything"
“Loved the front porch and view. We spent many hours there"
***Available full weeks only (Saturday to Saturday) in July and August; late June / early September. We do take less than 7 day rentals outside of July and August but our preference is for full weeks Saturday to Saturday. We typically hold out for full weeks in June/Sept till about 45 days out. We will sometimes book weekends earlier for an increased rate. Interaction with Guests: As much as they like. One of the most unique neighborhoods on all of outer Cape Cod. 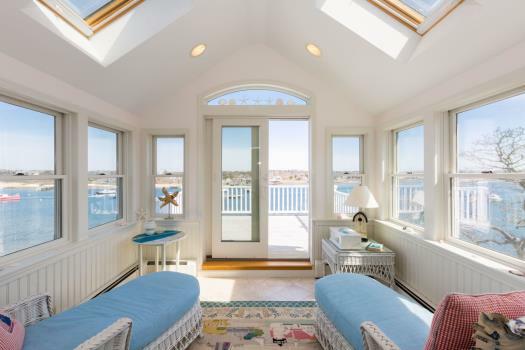 Overlooks both inland waterways and the Atlantic Ocean. 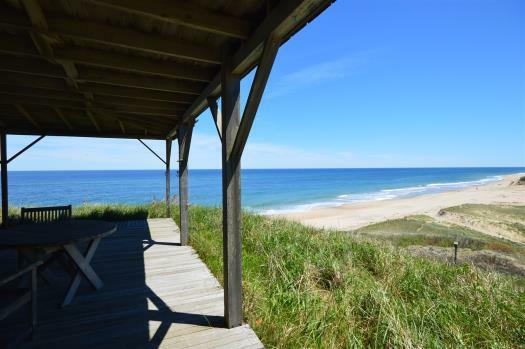 World renowned Nauset Beach is a short walk. House Rules: Treat the property with respect and enjoy your vacation! Notes: Typically renters bring their own sheets, towels etc. That said, there are some great local companies we can refer you to that have rental linens available that can be delivered to the home for an additional fee. Heating is limited to space heaters and fireplace. We can discuss if you are renting in spring, fall etc. Bedrooms are open to common ceiling (ie: you can toss tennis ball over wall and into next room.) Many varied groups have enjoyed without issue but we want everyone to be aware of this. Great service, clean website, everything was simple. Overall it was a great house. You definitely pay a view premium but that was expected. Location was great, dog friendly was perfect for us, etc. .Again, great week for the family and we'd definitely consider returning. They're all very nice, especially Devin, coming out in the middle of a storm to look at the grill gas tank that was leaking. Water view was even better than the pictures, the house was clean, and had enough room to comfortably accommodate my family of four and our two dogs. Everyone was super helpful and accommodating. We had a great time and loved the simple style, location and incredible view. I loved the cottage I rented ... especially the location and view. It was so relaxing and provided just the right feel for a perfect summer vacation. The cottage was exactly as described. Handles any little problems quickly! Very nice customer service! Favorite place on the Cape! Nauset Rental place in Nauset Heights is awesome, with great views and a yard that entertained 3 toddlers for hours on end. The living space itself accomodated our large group. With the inlet right there and beach just beyond it, you have the benefit of calm waters for kids, or the busier, bigger beach on the ocean. We hope to stay there again. We thoroughly enjoyed our week at this house. The location was ideal with access to both the inlet and outer beach. It was truly a Cape cottage with all the necessities covered. The outside shower was appreciated with kids and dogs and lots of sand. My husband and kids made good use of the front porch and lawn, too. Overall, it was a great experience. The view from the front porch/yard is every bit as great as in the pictures. A very peaceful/serene setting, yet close to everything (walking to harbor/ocean beach, quick drive to Orleans/nature trails/etc). The house itself was functional, but had everything we needed for a relaxing low-key long weekend (grill, stocked kitchen, plenty of seating in and out), and the bed was more comfortable than it needed to be. 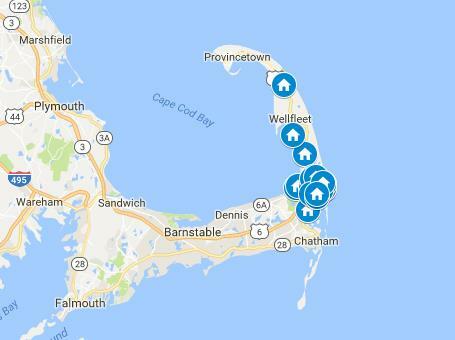 Nauset rental was great to work with -- arrival was a breeze, Kent provided a number of good recommendations for places to explore in the area, and checked in with us during our stay to make sure we had what we needed for a chilly day. We'd definitely come back!